On Friday night, the Thunderbirds beat the visiting University of Ottawa Gee-Gees 51-43 at home in the War Memorial Gym, showing that they could be a force to be reckoned with in the upcoming 2016/2017 season. For the first 10 minutes of the first quarter, the ’Birds had been leading the game until the Gee-Gee’s tied it at 11 a piece. Both teams came out with a lot of intensity — especially on defence — each wanting to prove that they were better than the other. Getting the opportunity to play a team from a different conference does not come very often and both teams were equally hungry for a win. However, the same energy was missing in the next quarter of the match. 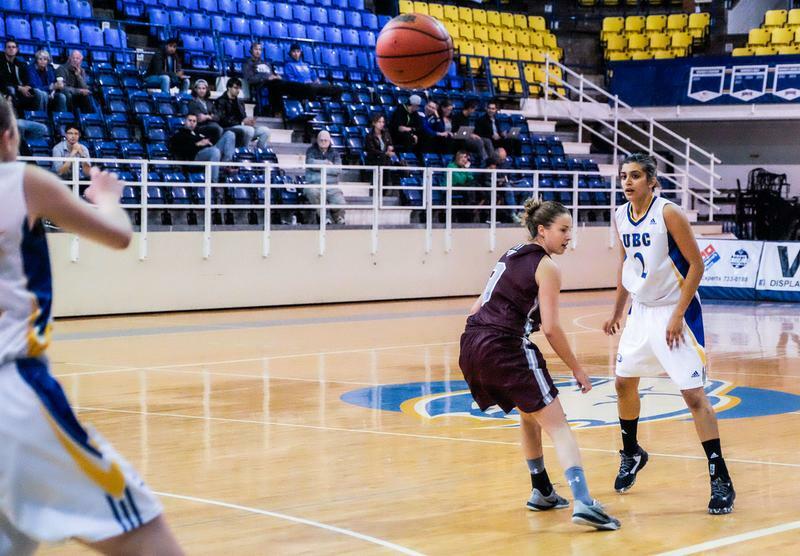 “I think the second quarter was a poor offensive quarter for both teams,” said UBC head coach Deb Huband, who is entering her 22nd season with the Thunderbirds. The ’Birds scored only six points while the Gee-Gee’s scored eleven in those 10 minutes. This resulted in the Gee-Gee’s leading 26-21 at halftime. But the T-Birds were not going down without a fight. At the start of the third, the ’Birds looked like a completely different team which allowed them to go on a 20-6 run. This was the turning point in the game and provided the edge that UBC needed to win. “In the third quarter, we put a different lineup in. We went with a smaller lineup and that just spurred us on, allowed us to get some quick scores, then we built a little bit of a lead,” said Huband. The end of the game was decided after that, but one should never take one's foot off the gas with the Gee-Gees’ defence. They refused to give up until the end of the game. Despite being behind, the team still had more bench points at 18 compared to the ’Birds at 13. Another area in which the Gee-Gees led the T-Birds was at the free throw line, shooting 92.3 per cent, while the T-Birds shot 85.7 per cent. Moreover, both teams did not shoot the ball extremely well, but the T-Birds had a slightly higher field goal percentage at 28.3 per cent, while the Gee-Gees’ were at 24.6 per cent. Additionally, the T-Birds were slightly better from the three-point line than the Gee-Gees, having made 3-19 while the Gee-Gee’s made 3-23 from downtown. It was a closely fought game, but the T-Birds’ third-quarter run was too big of a hurdle for the Gee-Gees to overcome. It was rookie Ali Norris — in only her second game as a Thunderbird — and veteran Kara Spotton, who stood out for UBC in the match. Norris ran some wonderful plays which got the team into a rhythm, while Spotton protected the paint the entire game. But altogether, the win came down to the entire team's effort. According to Huband, the team does not have a set starting lineup yet, as they have a lot of new players — including six rookies. Once the T-Birds do figure out their regular rotations, this team definitely should not be taken lightly. The ’Birds will be battling the University of Fraser Valley Cascades at 6 p.m. on Friday, October 14 for their next preseason game.